An electric scooter can make your walking or biking commute much easier and less strenuous. One thing most people do not realize is that the weight of an electric scooter will need to be considered as you will have to carry it at times. We are going to look at the top 3 lightweight electric scooters that can save you time, money, and physical stress. Within these three scooters, we are going to discuss our overall impression of the scooter, the pros/cons, price points, product features, and why you should purchase this scooter. We will also look at what each scooter weighs and compare their features. So let’s take a look at which scooter could be the best fit for you. 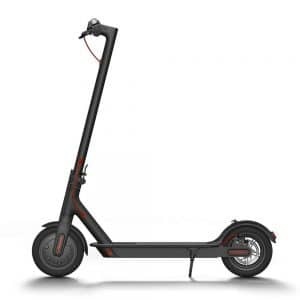 The first electric scooter on our list is the Xiaomi Mi electric scooter that is both lightweight and long lasting, two high quality features when choosing a scooter. This scooter has been built with functionality and durability in mind. Weighing only 26.9lbs, this scooter’s frame is made from aerospace-grade aluminum for low density and high structural strength. Couple this with its fold and go design, you can easily carry this scooter around wherever you can’t ride it. Safety was at the forefront of building this scooter with its many different features that allow you to travel as safe as possible. From tire treads to built-in lights, you can rest assured you are in good hands with this scooter. What makes this scooter so lightweight is the use of aerospace-grade aluminum for its frame. This allows the scooter to have a low density and high structural strength. The large 8.5” front and rear tires aid in shock absorption for a more comfortable ride. Anti-slip treads keep you safe on surfaces that may be a little slippery. To illuminate the road ahead and to keep you in the view of any traffic, ultra bright headlights are utilized on this scooter that have a range of up to 6 meters. Built in taillights on this scooter allow for a bright warning for anyone behind you that you are slowing down. This is a great safety feature to have when on public roads or zipping around campus. To stop this beauty, the designers have integrated a front and rear double braking system for a more efficient and responsive braking distance. It is designed to bring your scooter to a stop within 4 meters. Bluetooth allows you to use your smartphone for real time analytics. Sync your smartphone device to the scooter through Bluetooth and download the exclusive app to see your speed, remaining power, and many other stats. This scooter is going to be for those looking for a simplistic design, but packed full of features. With fast speeds and easy portability, anyone looking to get from point A to point B without having to worry about a scooter with a lot of bells and whistles should check out this Xiaomi Mi electric scooter. 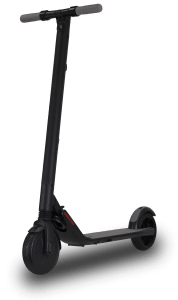 Second on our list is the GoTrax GXL Commuting electric scooter and it goes toe-to-toe with most of the Xiaomi scooter’s features, just at a lower price. At first glance you may notice that it shares some of the same looks as well. While its range is not as long, it does make for a great commuter with a run time of 12 miles. Weighing only 35lbs, this scooter easily folds down to a compact space for easy transportation to wherever you need to go. The all black look with red accents gives this scooter a very minimalistic and clean look. The most popular feature of this scooter is portability. With a lightweight design and its fold and lock storage feature, you can take this scooter just about anywhere. To give you the best speed and the most efficient use of it, the GOTRAX has an enhanced motor and battery. The 250W motor and 36W battery allow you to reach up to 15.5 miles per hour and a distance of up to 12 miles. To keep you comfortable on rougher terrain and safe on wet surfaces, 8.5” pneumatic tires have been used to allow for a smooth and durable ride. As a safety precaution to keep your speeds under control, this scooter has 2 speed settings. The 1st gear allows you to ride up to 10 miles per hour while the second gear allows for the full experience at 15 miles per hour. A built in speedometer uses a very modern LED screen to allow you to view the current speed at any time. This is located in between the two easy to use brake and gas twist style handles for the ultimate all in one control center. For those not wanting to spend a whole lot of money and not worried about traveling more than 12 miles a day, the GOTRAX scooter is one of the best options. It is lightweight, aesthetically pleasing, and built with safety in mind. As a leader in the personal transportation industry, Segway has done it again with this ES1 eScooter. This scooter shares many of the same design elements and functions as the previous scooters we reviewed in this article but has very nice additional features as well. Tipping the scales at less than 25lbs, this electric scooter ranks as one of the most lightweight electric scooters on the market. With its ability to be folded, you can easily transport and store it virtually anywhere. Packed full of the latest and greatest technology for electric scooters, you can rest assured that this scooter is built with safety and comfort in mind. With speeds of up to 12.4 mph, it is not the fastest on the list, however it does have a 15.5 mile range on a full charge. Segway has really pulled off everything they could think of with this scooter. It is loaded with many features that some would not have even considered, but the buyer will benefit greatly from. To keep you perfectly balanced at speed and to absorb the shock of the roadway, Segway has utilized large, lightweight wheels and tires on the ES1. The tires measure 8” in the front and 7.5” in the rear for an even, smooth ride. One feature we have not seen on other scooters that makes an appearance on the ES1 is cruise control. Segway has added this feature to allow you to find your perfect speed and lock it without having to constantly adjust the accelerator paddle. To keep you and your Segway safe, an anti-lock braking system is used to give you a better grasp on your scooter when slowing down. Segway also added in a heavy-coil suspension on the front wheel to help with the shock absorption and reduce bouncing on uneven roads. Segway is well known for their attention to detail and their quality components. 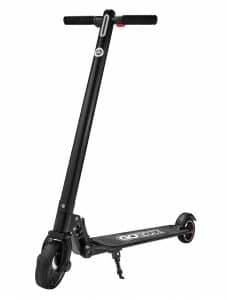 If you are looking for an all in one scooter that has every feature you could imagine while sporting a minimal, sleek design, then this scooter is for you. We would say that this scooter is best for those wanting to commute to a close job or to zip around campus at college. So there you have it, the top 3 lightweight electric scooters handpicked to provide you the best quality and value. It is important to take into consideration the weight of an electric scooter as you will have to carry your scooter with you at your destination. A lightweight scooter will also help with the overall performance as the scooter’s motor will not have to work harder than necessary to push the additional weight.